Woodbridge, VA, Feb 10th 2019 - Root Electric is proud to announce that it has earned the home service industry's coveted Angie's List Super Service Award (SSA). This award honors service professionals who have maintained exceptional service ratings and reviews on Angie's List in 2018. Angie's List Super Service Award 2018 winners have met strict eligibility requirements, which include maintaining an “A” rating in overall grade, recent grade and review period grade. The SSA winners must be in good standing with Angie's List and undergo additional screening. 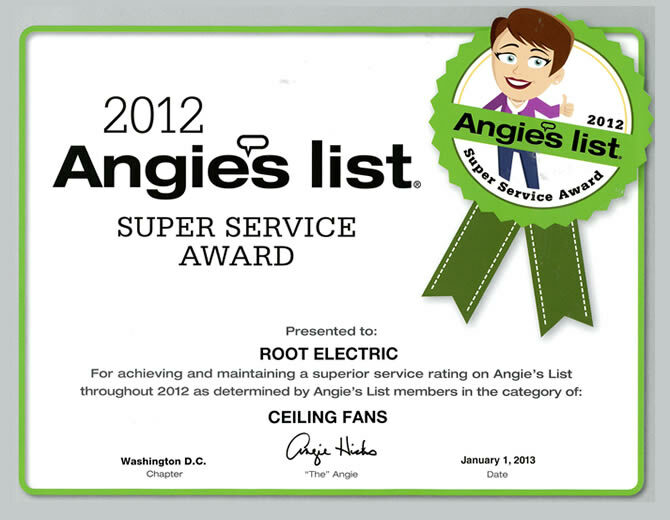 Root Electric has been listed on Angie's List since 2008. This is the 10th year Root Electric has received this honor. Root Electric has earned the service industry’s coveted Angie’s List Super Service Award, reflecting an exemplary year of service provided to members of the local services marketplace and consumer review site in 2015. Ratings are updated daily on Angie’s List. Companies are graded on an A through F scale in areas ranging from price to professionalism to punctuality. 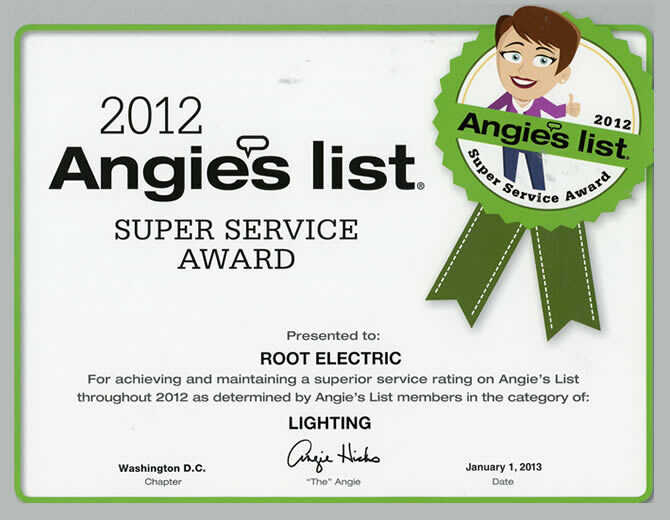 Root Electric has earned the service industry’s coveted Angie’s List Super Service Award, reflecting an exemplary year of service provided to members of the local services marketplace and consumer review site in 2014.“Only about 5 percent of the Electrical Contractors in Prince William County have performed so consistently well enough to earn our Super Service Award,” said Angie’s List Founder Angie Hicks. “It’s a really high standard.”Angie’s List Super Service Award 2014 winners have met strict eligibility requirements, which include an “A” rating in overall grade, recent grade, and review period grade; the company must be in good standing with Angie’s List, pass a background check and abide by Angie’s List operational guidelines. Root Electric Services has been named a 2014 Best Pick by EBSCO Research, an independent consumer research firm that produces the publication Best Pick Reports. Root Electric team has earned to be listed at Angie’s List Honor Roll for their outstanding work. Root Electric has received 12 A-rated reports from Angie’s List members in the past 60 days and is qualified to be listed at the Honor Roll.